WASHINGTON — The Senate on Thursday killed a Republican effort to let employers and health insurance companies deny coverage for contraceptives and other services to which they have religious or moral objections. The vote was 51 to 48. 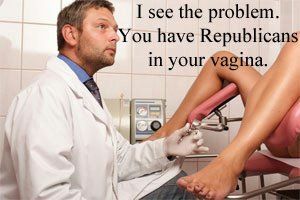 In effect, the Senate upheld President Obama’s birth control policy. The policy guarantees that women have access to insurance coverage for contraceptives at no charge, through an employer’s health plan or directly from an insurance company. The vote generally followed party lines. Senator Olympia J. Snowe of Maine, who said this week that she would not run for re-election, was the only Republican to vote with Democrats to kill the measure. If you are concerned by the appallingly narrow margin this amendment was defeated by, I suggest you keep that in mind come fall. And do your part to preserve the, apparently tenuous, hold sanity still has on our society. Because this does not have to be my/your/our future. Just saying. This entry was posted in Advocacy and tagged advocacy, birth control, women's health by nursemd. Bookmark the permalink.